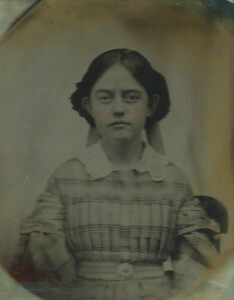 Maria D. Kimball (1832 – 1919) was the daughter of North Andover blacksmith Thomas Kimball and his wife Damaris (Gleason). She graduated from the State Normal School in Bridgewater in 1852 and taught for twenty-two years at the co-ed Chapman Grammar School in East Boston. She never married, and lived after her retirement with her brother in North Andover.